*This month’s special events are Pentecost Sunday, The Holy Trinity, The Most Sacred Heart of Jesus and The Immaculate Heart of the Blessed Virgin Mary. 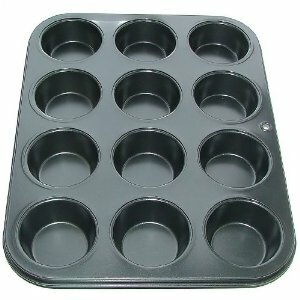 Pentecost Activities- activities, crafts, games, snacks, puzzles, worksheets, mazes, etc. Holy Spirit- activities, coloring, crafts, games, puzzles, etc. 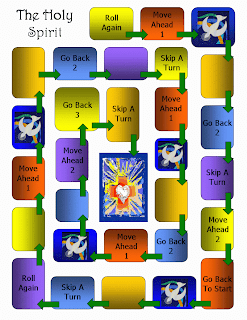 The Holy Spirit File Folder Game- Work your way around the board and answer questions about the Holy Spirit. For 2nd grade on up. There are a lot of choices and possibilities for this game. Fruits of the Holy Spirit (Catholic)- Spin the spinner and follow the directions. If you spin “Leader’s Space” you may change places with the leader and put his marker where you were. Make your way around the board answering questions about the fruits of the Holy Spirit. The first player to FINISH wins. Fruit of the Holy Spirit Bean Bag Toss (Catholic)- Here is a fun way to learn the 12 fruits of the Holy Spirit from CCC1832. 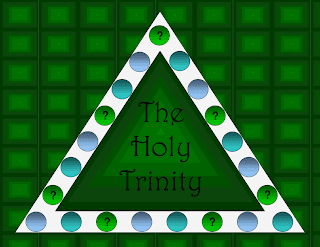 Holy Trinity- activities, coloring, crafts, games, puzzles, etc. 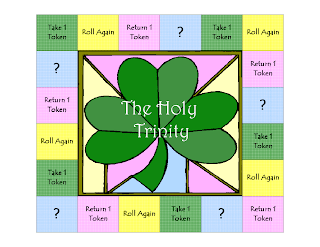 Holy Trinity File Folder Game- The objective of the game is to collect the most tokens by answering questions correctly about the Holy Trinity. fisheaters.com- Devotion to the Sacred Heart of Jesus, what it is, rituals involved, etc. catholicicing.com- Sacred and Immaculate Heart Rosaries- A Fun Catholic Craft!